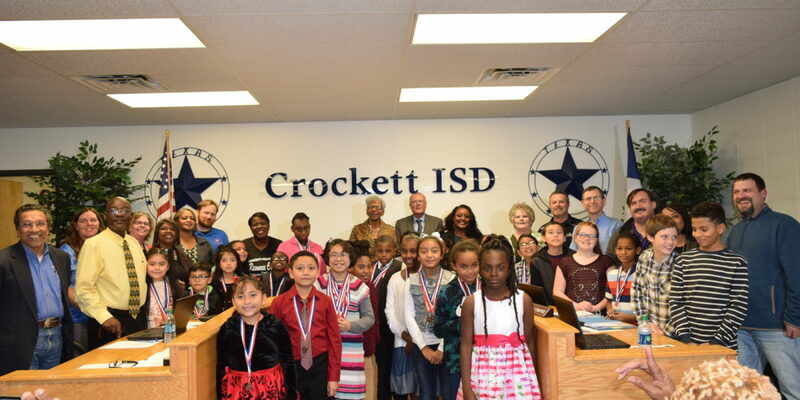 CROCKETT – During the monthly meeting of the Crockett Independent School District Board of Trustees, the Crockett Elementary School UIL District Champions were recognized by the trustees and the administration. Following a joint meeting between the CISD Board and the Crockett City Council to ratify the sale of the former state school property, the UIL academic students were introduced to those in attendance. “We have our elementary, UIL academic, two-time, consecutive academic champions here with us tonight,” Crockett ISD Superintendent Terry Myers said, before he yielded the floor to Crockett Elementary Principal Robin Stowe. After she recognized the coaches, teachers and parents who helped the students along the way, Stowe asked Elementary UIL Coordinator Dr. Loria Ewing to announce the students and their awards. “There were 10 first place team awards, seven second place team awards and two third place team awards. There were 11 first place individual awards; nine second place individual awards; 13 third place individual awards; eight fourth place individual awards; 12 fifth place individual awards and 11 sixth place individual awards. Crockett Elementary is number one in the district,” Ewing said. The second grade team won second place in chess. The individual participants were: Alexander Ledesma; Alexia Grimaldo; Autumn Collins; Ava Horace; Cassidy Abbs; Estrella Sosa; Humberto Cervantes; Kaden Bryant; Kayla Anderson; Keyontra Robinson; and Zoey Ortega. The third grade team won: second in math; second in chess; second in spelling; and first place in music memory. The individual students were: Aliyah Chance; Christopher Bell; Emelie Arvizu; Emily Gonzales; Ethan Quintero; G’Kedria Dixon; Janaya Bruins; Jasmine Alvarado; Jeremiah Kellum; Juan Nava; Kavian Bryant; Krish Konidala; Patrick White; Rigoberto Castro; Ryan Wier; Takayla Dedon; Tiara Simmons; and Torilyn Marschall. The fourth grade team won: second place in number sense; first place in chess; second place in spelling; first place in music memory and first place in art. The individual students were: Ayden Sherman; Ayriel Parker; Belinda Mancilla; Brokeyvia Craig; Emory Sims; Jayah Cobb; Jennifer Mendez; Kiva Knox; Malachi Anderson; Miriam Moran; Nathaniel Daniels; Sherlyn Garcia; Treant Cannon; and Valery Garcia. The fifth grade team won: first place in number sense; first place in chess; second place in spelling; first place in listening skills; third place in social studies; first place in music memory; first place in dictionary skills; first place in maps, graphs and charts; and third place in art. 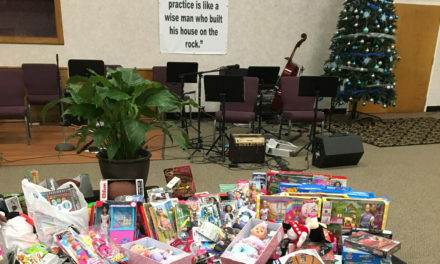 The individual students were: A’Miya Rhodes; Ania Duren; Antonio Ledsma; Aubrey Moore; Donna Jean Colbert; Juan Perez; Kaidyn Senegal; Katelyn Shepherd; Lauryn Griffin; Leonbert Pare; Madeline Bucheck; Makatelynn Harris; Mariah Lewis; Nicolas Allen; Nithya Konidala; Tania Davis; Traye Babb; Victoria Campos; and William Murphree. Following the UIL recognition, the CISD superintendent also took time to recognize the Board of Trustees. “We have a great board of education who allowed to be the superintendent of schools here in Crockett. They represent all of Crockett. They care about children and they don’t care about race, background, creeds or religions. They simply care about the children. 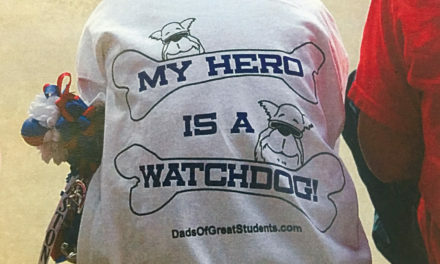 They care about the parents and parental concerns. 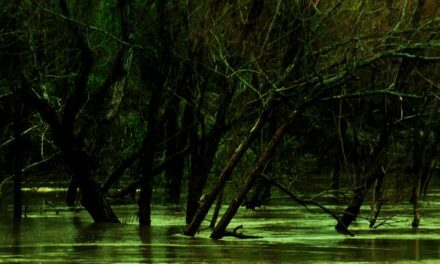 They attack issues head-on,” Myers said. A resolution regarding hazardous traffic conditions was approved by the trustees. Issues relating to the May 5 election were approved by the board.